North Korea has carried out another ballistic missile test, just few days after Moon Jae-in took office in South Korea. According to Japanese officials, the missile was launched from north-western Kusong. South Korea’s newly elected President Moon Jae-in, who campaigned on a platform of better engagement with North Korea, said it was a provocation. President Donald Trump has called for “stronger sanctions” against North Korea, while China is urging restraint. 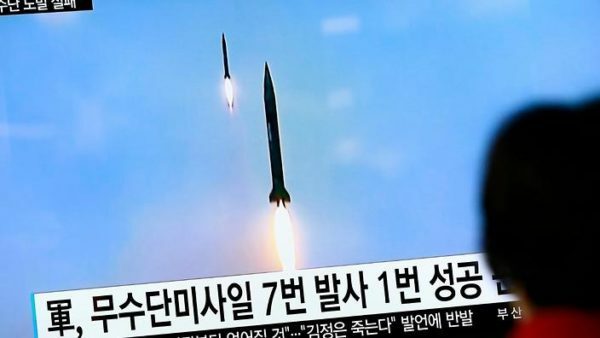 A series of North Korean missile tests this year – which are banned by the UN – has sparked international alarm and raised tensions with the US. Two missile launches last month both failed, with the rockets exploding just minutes into flight. The nature of the launch is still being determined, but analysts have said the test could suggest a longer range than previously tested devices. According to the Japanese defense minister, the missile flew for about 30 minutes before falling in the Sea of Japan and could be a new type of missile, Reuters reported. Tomomi Inada said it covered a distance of 435 miles, reaching an altitude of more than 1,245 miles – higher than that reached by an intermediate-range missile North Korea fired in February. The US Pacific Command said in a statement the type was being assessed but that its flight was not consistent with that of an intercontinental ballistic missile [ICBM], which would have the range to reach the US mainland. North Korea is believed to be developing two types of ICBM, but neither has so far been flight tested. After hosting an emergency meeting of his security council, South Korea’s President Moon Jae-in condemned the latest launch as a “provocation”. “The president said while South Korea remains open to the possibility of dialogue with North Korea, it is only possible when the North shows a change in attitude,” his spokesman said. The White House said President Donald Trump “cannot imagine Russia is pleased” because the missile did not land far from Russian territory. It added that the new launch should serve as a call for stronger sanctions against North Korea. A Kremlin spokesperson later said Russian President Vladimir Putin was concerned by the test. China, North Korea’s only major ally, called for restraint by “all relevant parties” in the wake of the latest test. North Korea has conducted five nuclear tests despite UN sanctions and is also developing long-range missiles.